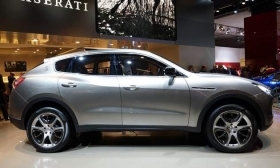 Maserati revealed the Kubang concept last week at the Frankfurt auto show, and the vehicle is a strong indication of what the production SUV will look like. FRANKFURT -- Maserati S.p.A.'s new SUV was one of the most sought-after models at the Frankfurt auto show last week and Ferrari S.p.A. predicted record sales as executives said ultra-luxury remains recession-proof. "If you go to the Ferrari stand, there aren't any customers worried about the recession," Fiat CEO Sergio Marchionne said at the Frankfurt show. "The last Ferrari customers I saw at the show weren't crying." Fiat's two upscale brands may help the carmaker weather a decline at its main business as Europe's credit crisis worsens. Even without the Kubang SUV, Maserati aims to boost deliveries by almost eightfold to 45,000 cars in 2014 as it increases dealers by 150 percent worldwide. Lamborghini S.p.A.'s new Aventador model is sold out for 18 months and Rolls-Royce Cars announced a 10 million-pound ($15.8 million) expansion at its plant in Goodwood, England. Ferrari expects to deliver 7,000 cars in 2011 on demand for its first family car, the $356,000 four-seat FF that came to market this year. Fiat's most profitable unit plans to cap sales at 7,000 going forward to maintain exclusivity. Ferrari targets "significant" results this year after earnings before interest and taxes rose 23 percent in 2010 to 302 million euros ($414 million) on revenue of 1.92 billion euros, Chairman Luca Cordero di Montezemolo said. "I'm not worried because we have quality, exclusivity, a strong brand and innovative technology," Montezemolo said in an interview when asked about the effect of the economic slowdown. The ultra-luxury optimism stands in contrast to concern voiced from volume carmakers that a worsening debt crisis in Europe is prompting consumers to rein in spending. PSA/Peugeot-Citroen CEO Philippe Varin said this week that Europe is facing a possible recession, while Ford Motor Co. said sales in the region next year will be little changed. BMW AG, the world's biggest maker of luxury cars, is the best performer in the Stoxx 600 Automobiles & Parts Index this year. BMW stock has slipped 6.4 percent, compared with a 24 percent loss for the index. Fiat, which also owns Chrysler Group LLC in the United States, is the worst performer on the index, with a 42 percent decline. Sales of the main high-end European luxury brands -- Maserati, Lamborghini, Ferrari, Bentley, Rolls-Royce and Aston Martin -- will rise 19 percent this year to 28,090 vehicles, and gain another 13 percent in 2012, according to a forecast from industry analyst IHS Automotive. "The rich have gotten richer and the number of millionaires in emerging countries is really growing so the demographic trend is very positive" for the ultra-luxury carmakers, said Erich Hauser, a London-based Credit Suisse automotive analyst. "Things would have to get very nasty before they face a problem." Rolls-Royce, owned by BMW, expects in 2011 to break last year's sales record of 2,711 cars, CEO Torsten Mueller-Oetvoes said, adding that China may overtake the U.S. as its top market. The German executive said he's "optimistic" about the prospects for the super-luxury segment and that his company so far has not been affected by the slowdown. The ultra-premium segment is likely to weather this downturn better than the previous crisis, Mueller-Oetvoes said. Along with the factory expansion, Rolls-Royce may boost its dealerships to 100 from the current 85 and add a coupe version of its best-selling Ghost model, he said. The carmaker debuted an extended-wheelbase version of the Ghost in Frankfurt. Lamborghini, owned by Volkswagen AG, unveiled the 189,000 euro Gallardo LP 570-4 Super Trofeo Stradale at the show, the most powerful addition to the Gallardo series. The 570-hp vehicle comes with matte black finish on the large rear spoiler, engine hood and front air intakes and surges to 100km (62 miles) in 3.4 seconds. Deliveries of the model will be confined to 150 and start in December, CEO Stephan Winkelmann said in an interview. The Volkswagen division also announced production of the 1.6 million euro Sesto Elemento. No more than 20 will be built with deliveries due in early 2013. Lamborghini sales may advance from last year's 1,302 on the back of the Aventador LP 700-4, which will hit showrooms in October and is sold out for 18 months, Winkelmann said. "The super-luxury market has been in steady recovery from its low in 2009," Winkelmann said in an interview, adding that order books at Lamborghini are showing no declines. "We're aware that there are risks." Bentley Motors Ltd., whose customers include Queen Elizabeth II and the Sultan of Brunei, rolled out an updated version of the Continental GTC convertible with deliveries of the 575-horsepower model starting before the end of the year. Powered by revamps of the Mulsanne and Continental models announced over the past year, full-year deliveries may top the 7,000 mark which would mark a 40-percent gain on 2010, CEO Wolfgang Duerheimer said in an interview. An SUV that the VW unit is considering may help more than double sales to 15,000 by about 2018, he said. "We're very optimistic, our business is developing extremely soundly and the order situation is looking good," Duerheimer said. "We mustn't talk up a crisis. Growing debt problems in Europe and the U.S. are giving enough reason for concern, but the underlying economic picture remains positive."